SEATTLE--(BUSINESS WIRE)--Dec. 1, 2014-- Amazon.com, Inc. (NASDAQ: AMZN) today unveiled its eighth generation fulfillment center, which utilizes robotics, Kiva technology, vision systems and almost 20 years’ worth of software and mechanical innovations to fulfill holiday orders. The company is currently operating 10 of this new generation of fulfillment centers across the U.S.
“The Amazon fulfillment teams are dedicated to innovating in our fulfillment centers to increase speed of delivery while enabling greater local selection at lower costs for our customers. 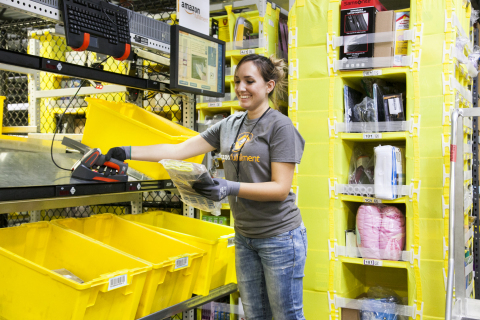 The advancements in our latest fulfillment centers hit all three of these customer desires while continuing to provide a work environment that is great for employees,” said Dave Clark, Amazon’s senior vice president of worldwide operations and customer service. New, high-end graphically oriented computer systems for employees to use while fulfilling orders for customers. Amazon recently announced it will hire 80,000 seasonal employees to fulfill customer orders this holiday, a 14 percent increase over last year. The company expects that thousands of those employees will stay on in regular, full-time roles. View photos and videos of Amazon’s eighth generation fulfillment center here. Learn more about Amazon’s Cyber Monday deals here. Amazon.com opened on the World Wide Web in July 1995. The company is guided by four principles: customer obsession rather than competitor focus, passion for invention, commitment to operational excellence, and long-term thinking. Customer reviews, 1-Click shopping, personalized recommendations, Prime, Fulfillment by Amazon, AWS, Kindle Direct Publishing, Kindle, Fire phone, Fire tablets, and Fire TV are some of the products and services pioneered by Amazon.